OXFORD, Miss. – What happens when the lights go out on society as we know it? The first show of the Ole Miss Theatre spring 2019 performance season offers a challenging – and strangely comforting – answer to that question. “Mr. Burns, a post-electric play,” written by Anne Washburn, opens Friday (Feb. 8) in Meek Auditorium at the University of Mississippi. The 7:30 p.m. performance will be followed by a reception at the Oxford-University Depot. Additional showtimes are 7:30 p.m. Feb. 9-10 and 12-16 and 2 p.m. Feb. 9-10 and 16-17. Tickets are available at the Ole Miss Box Office or by calling 662-915-7411. The narrative, which could be summarized as “variations on a theme by Matt Groening,” follows a group of people trying to navigate a frightening post-apocalyptic landscape in the years following ecological disaster. 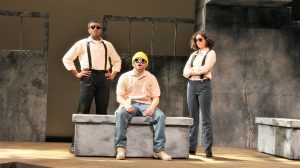 “This play is really about the power of storytelling and the role that storytelling has in our lives,” said Matthew Shifflett, instructional assistant professor of theatre arts and director of the production. The story characters tell and retell over the play’s 80-odd-year timeframe is a single episode of the long-running animated Fox television show “The Simpsons,” and it reverberates through the show’s three acts as if through a game of telephone – in which one of the players is a nuclear reactor. In the first act, set in the near future, a group of people sit around a campfire trying to “re-member” the “Simpsons” episode “Cape Feare” – a remembrance in and of itself, of both the 1962 film and its 1991 remake. If you don’t know the play’s back story, this scene could be some friends just shooting the breeze, albeit with a weirdly heightened level of intensity. “These characters have been through a cataclysmic event and are trying to put back together the kind of world they can live in, and stories are a lot of what guides them there,” Shifflett said. When a stranger emerges from the woods and interrupts their brainstorm, it quickly becomes clear that this isn’t just another Friday-night hangout. The second act takes place seven years later, nearly a decade into the post-electric future. By this time, a kind of entertainment industry has emerged around the telling and performing of stories, and parts of shows – even single lines – are being bought and sold for things such as batteries and Diet Coke. Traveling troupes are performing different “Simpsons” episodes and other popular ’90s-era television shows, as well as other sticky bits of pop culture, including commercials and music videos. 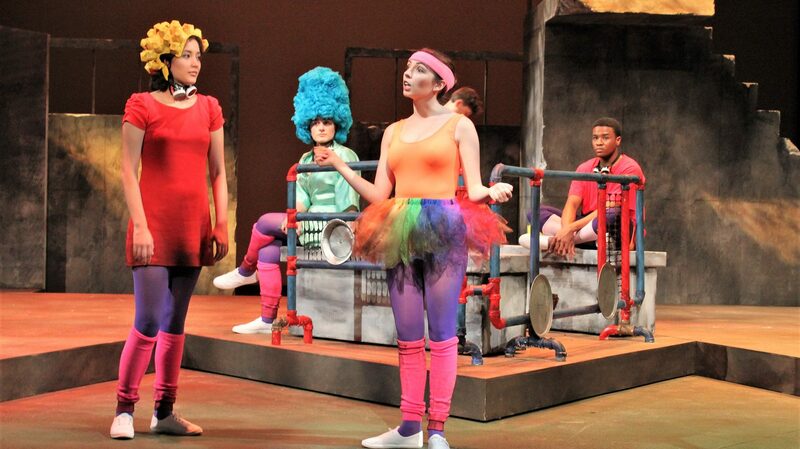 The group from the first act has become a bona fide theatre troupe, and the scene revolves around their rehearsals of “Cape Feare” and interspersed television commercials, in which they work at recreating sensory experiences such as the smell of bubble bath or the flickering lights of a television screen – experiences that might seem mundane, but in the world of the play invoke a specific kind of longing. “Nostalgia is a funny thing, because it’s part ironic and part sincere,” Shifflett said. The third act is unlike anything we’ve seen before. Set 75 years into the future, at which point “The Simpsons” has become part of the theatrical canon, the act is essentially an operatic rendering of the “Cape Feare” episode – on a boat, of course. “Part of what makes the third act so interesting is that we’re seeing something we’re so familiar with – ‘The Simpsons’ – refracted through the eyes of a generation who have had no direct experience of the show. … So, just like if you think about how images and attitudes toward Santa Claus have changed in the last 100 years, you see that happen to the Simpsons characters,” Shifflett said. Design is important in every production, but a show with its basis in something extremely familiar and visually iconic presents its own special challenges, especially when that visual motif undergoes a dramatic transformation from one act to the next. Costume designer John Polles, a senior in the Bachelor of Fine Arts program in theatre arts with emphasis in design and theatre production, enjoyed tackling the show’s unique challenges. While the first and second acts are fairly straightforward from a costuming standpoint, the third is more nuanced, Polles said. “What we were going for is creating this kind of religious, churchlike experience for the third act, so we incorporated styles of Japanese Noh and ancient Greek theatre while also keeping some of the more iconic shapes and silhouettes of the Simpsons,” he said. The design challenges extend to the physical spaces that the actors occupy throughout three very different acts, two of which contain performance within performance and all of which must appear to function without electricity. 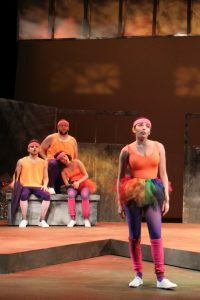 “With a show that envelops almost all theatrical conventions, challenges in design are inevitable; we had mountains to climb as a design team,” said Krista Franco, the show’s guest scenic designer and an assistant professor of theatre arts at Stetson University, where she is developing courses in arts entrepreneurship. This is her second production to guest-design for Ole Miss Theatre. One of Franco’s solutions was to design a distinct set for each act (rather than starting with a single, broad scenic “canvas” and building changeable elements around it) and in doing so, she thought about how the space would evolve with the characters along the arc of the story. “From a scenic perspective, I paid attention to the growth of the characters within the story in order to decide what types of details articulated the spaces they inhabited from one act to the next,” Franco said. As the characters become more accustomed to and confident in the post-electric world, and as the storytelling progresses from recollections around the campfire to full operatic performance, the physical world is changing as well. “The use of recognizable materials and shape grammars reveals something distinct within each act,” Franco explained. The play is challenging on many levels, and though “nuclear apocalypse” is hardly the language of a feel-good production, Shifflett believes there’s a sweetness to the show’s overarching message. “We’ve put a lot of heart into this show,” Shifflett said. “Anne Washburn has written a really interesting script that leaves a lot of room for the production, and the actors have brought the characters to themselves really successfully; there’s a sense of ensemble between them that is touching to watch.